The Crab Nebula is one of the best-studied astrophysical objects of all time and shines across the whole accessible electromagnetic spectrum, from radio wavelengths up to very high energy (VHE, E > 100 GeV*) gamma-rays (, ). It is powered by the Crab Pulsar, a fast-rotating neutron star (period P = 33 ms) possessing an ultra-strong magnetic field. It was created during a supernova explosion seen in the constellation Taurus in 1054 A.D. A part of the rotational energy of the Crab Pulsar is converted into electron-positron pairs, forming a pulsar wind. The electrons and positrons are shocked and accelerated to ultra-relativistic energies at the wind termination shock. These high-energy particles propagate outwards and lose energy via the emission of synchrotron and Inverse Compton (IC) radiation resulting from interactions with magnetic and photon fields, respectively. The synchrotron radiation ranges from the radio regime up to around 1 GeV, and its emissivity depends on the density of high-energy particles and the strength of the magnetic field. Thus, the spatial extent of the synchrotron emission is determined by a convolution of the local electron distributions with the magnetic field, where the latter is expected to vary significantly through the nebula. The second important emission mechanism is IC scattering: Energetic electrons and positrons can transfer a fraction of their energy onto photons thereby transforming these to high-energy and VHE gamma-rays. In the case of the Crab Nebula, the dominant target photon field is the synchrotron emission of the nebula itself, generated by the same particle population. This photon field is expected to be more homogeneous than the magnetic field. Thus the IC emission can be taken as a much more reliable tracer of the distribution of relativistic electrons, revealing more about the underlying physics of one of the Milky Way's most prominent and interesting particle accelerators. Fig 1: Top: Distribution of gamma-ray candidates from the Crab Nebula (Data ON) together with background events (Data OFF) as a function of the squared distance to the source position. The simulated PSF and the PSF convolved with the best-fit Gaussian are shown for comparison as well. Bottom: Significance of the bin-wise deviation (MC - Data) of the measured events when compared to the PSF (black) and the convolved one (orange). The distribution of events from the Crab Nebula as a function of the (squared) distance to the source is shown in Figure 1 (blue crosses). For comparison, the PSF is shown as well (black) and is obviously highly inconsistent with the data, where the probability for consistency of the two distributions amounts to merely around 10-14. The broadening of the data distribution with respect to the PSF can only be explained when assuming an intrinsic source extension. The PSF was iteratively convolved with a Gaussian source model of different width. The extension is obtained by comparing the compatibility of the data and the convolved PSF each time, and the best-fit extension is found to be σCrab = 52.2'' &pm; 2.9'' &pm; 7.8''sys. This Gaussian width σCrab corresponds to 39% source containment. 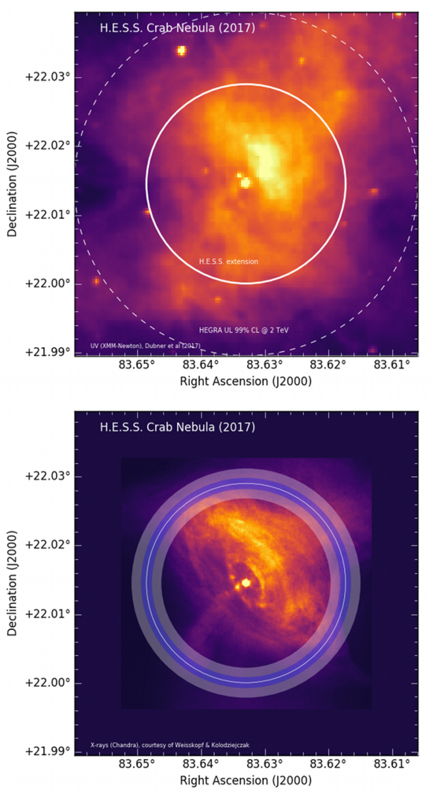 The size of the Crab Nebula in gamma-rays has been measured for the first time and can now be put in context to its morphology seen at other wavelengths. Our resulting Gaussian width is overplotted on images of the Crab Nebula at UV wavelengths (λ = 291 nm) and X-ray energies (0.1 - 10 keV) on the top and bottom of Figure 2, respectively. While the gamma-ray extension is obviously small compared to the optical/UV size, it is the other way around when comparing the gamma-ray to X-ray extension. This can be understood when considering the energetics of the electron population responsible for the respective emission. (***) One arcminute corresponds to 1/60th of 1°. An arcminute (or 1') can be further subdivided into 60 arcseconds (60''). 1° thus equals 3600'', making it the angular equivalent of an hour.